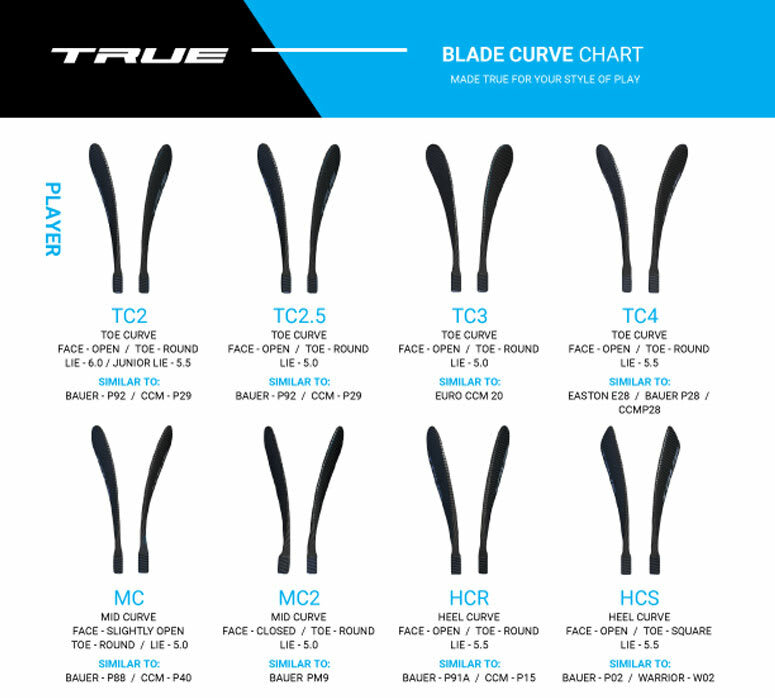 TRUE A Series Pro Grip Composite Hockey Stick - Senior is rated 4.4 out of 5 by 12. The True Hockey A Series Pro Composite Hockey Stick combines the feel and performance many have come to expect from True sticks with a pro-style build used by high end players to deliver a more durable and dependable stick for a longer period of time. The A Series Pro Stick is built for players who are on the ice day in and day out and expect the same performance in practice as they do in a game. The Dependability is coupled with a stick that features plenty of high end technologies only found in True Hockey Sticks. The True A Series Pro stick features Axenic Technology, a TRUE one-piece compression molded shaft that makes True sticks one of a kind and can be found utilized in the high-end A6.0 sticks as well. The True A Series Pro stick combines the Axenic Technology with their signature BRT+ blade technology, delivering unmatched balance. The Braided Rib Blade technology provides the best puck feel on the market. This type of response and control is demanded by many high-end player to allow them to perform at their highest level without skipping a beat. The True A Series Pro Sticks are exclusive to Pure Hockey and offer pro level feel, durability and dependability at a price point well below the top of the line sticks. Rated 4 out of 5 by hankgillette from Great shot I got one of these for Christmas along with a CCM Jetspeed and a CCM Jetspeed Pro and it is my go-to stick. It has an amazing shot and is extremely accurate. I have used it for 12 or so games so far and I love it except the toe is chipped away and almost non-existent at this point. It is not the most durable stick ever but nevertheless, it is still a good bang for your buck compared to the top end CCM sticks. Rated 4 out of 5 by j1michalak from Good so far Very good so far. Only a few skates in. Very similar to the E28 but you probably get a bit more lift on the puck for a similar short selection - few shots going over the net now. Has a great "crack" sound when sending a hard pass. Great feel in the hands - I like it better then the Easton E28 for that. Rated 5 out of 5 by TJ17 from Amazing. Started with the A2.2 and was looking for something a little bit better. I loved my original true stick I had but the Pro with HCS blade has been amazing. Super light. Sleek. And down right bad. Definitely sticking with True. Rated 5 out of 5 by Cd97 from Great Had negative speculations about the pro line before I bought. Purchased and love it. For some reason, feels better than some of the other models. More durable, stronger, and feels better. Glad I purchased. Rated 5 out of 5 by Hockeyjay from Top notch Twig Was hesitant about this... as i've always used top of the line sticks from easton. I'm very happy with the stick. Plays and feels like a 200+$ stick. Rated 5 out of 5 by Mike1313 from Great pop! Used only one game so far but love the feel. Light and has great wrist shot power. Great with slap shot too. Rated 2 out of 5 by Howitzer from Blade broke twice Blade broke under warranty. Same thing happened to the second stick. Good price and weight though. What is the length of this stick? Is the shaft extended a couple of inches like other brands tend to do with their Pro models? This stick is going to be about 430 grams. Thanks! Where is the kick point on this stick? I&rsquo;m using the A6.0 HT currently.